It's happening again. For the first time. A Sharknado video game. Sharknado just won't let up! Not only is there a sequel to the Syfy Original Movie that no one--not even Syfy--expected to blow up like it did, there will now be a Sharknado: The Video Game. The game will be an endless runner and is being developed for iOS by Canadian studio Other Ocean Interactive. Other Ocean is responsible for titles like Castlevania: Symphony of the Night for the Xbox Live Arcade and Super Monkey Ball for the iPhone. The game puts you in the hands of Fin, the protagonist of the films, as he makes his way through shark-infested tornadoes... because what else would it be about? You'll be able to bounce off the backs of tiger sharks, slash sharks with a broadsword, and dive into the heart of a shark with a chainsaw. 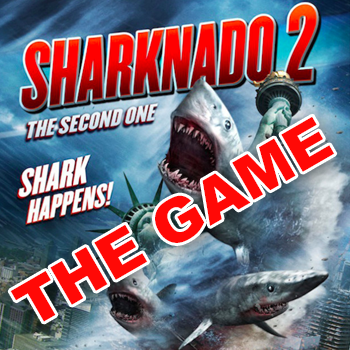 The game is set to release in the summer sometime before Sharknado 2: The Second One is scheduled to premiere on July 30th on the Syfy channel. Majesco Entertainment is publishing the game. Other Ocean designer Frank Cifaldi is ecstatic about this opportunity, "When Majesco approached us about making a Sharknado game, we said 'yes' before they'd even finished asking." Cifaldi says we can expect the game to be in the same vein as the source material, "The game we came up with is very much in the spirit of the films: ridiculous, overblown, yet oddly sincere. We can't wait for fans to sink their teeth into it."